Another month, another bag from ipsy. The overall: Super displeased with this bag. Maybe I’m just grumpy from all the snow we’ve gotten lately. ModelCo Blush in whatever shade I dunno pinky coral (sample?) – I’m guessing this is a sample size, since the packaging is different from what’s on their website. They list their full size at $22, so I hope this was a sample, anyway! I don’t know what I have to do to get ipsy to understand that I. Do. Not. Want. Blush. I’ve indicated it on my beauty quiz and I rate every blush and bronzer terribly, but here we are. Mitchell and Peach Fine Radiance Face Oil (sample) – I LOVE face oil. I HATE fragranced products. Why, ipsy? Why you gotta ruin my day like this? I didn’t even try it because I know it would be miserable for me. Fine enough, considering that the full size is just twice the size of this sample and costs 33 Pounds. Eva NYC Up All Night Volumizing Spray (sample) – I’m sure this product is great, but it froze in our subzero temps, so I didn’t get to try it. It only just thawed this morning. At $24 for 8 ounces, I doubt I’m going to feel like it’s worth the cash. Emite Make up Professional Eye Lash Curler (full size) – So here’s the thing: I feel like if you want to own an eyelash curler, you already do, and it’s working just fine for you. If you don’t, you never want to own one and they’re terrifying to you. Even if you’re on middle ground about eyelash curlers, you’re not going to get one and think, “Oh, this tool is amazing! Surely this brand’s other items are just as incredible!” Am I wrong? Either way, they list this for a whopping $25, which to me is outrageous considering that I got an eyelash curler that does the same job just as comfortably for $3. City Color Cosmetics Creamy Lip Stain in Flirtini (full size) – Oh, this is fine. I wouldn’t call it a lip stain so much, but it’s fine. It looks like a muted-down Barbie pink in the tube, but it looks lovely on me and has a nice (if thick) matte finish. Once it dried, it was fairly long-lasting, but not a stain. As usual my bag is slightly different. I love the bag itself — very into pink right now! Blush : I can’t tell if my blush got extremely broken in the mail or if it’s supposed to be like mineral powder or what but it looks like a hot mess. I’m not opening it. I think all those surveys and ratings we fill out for ipsy do nothing to customize our choices, not even to put us in one bucket or another. 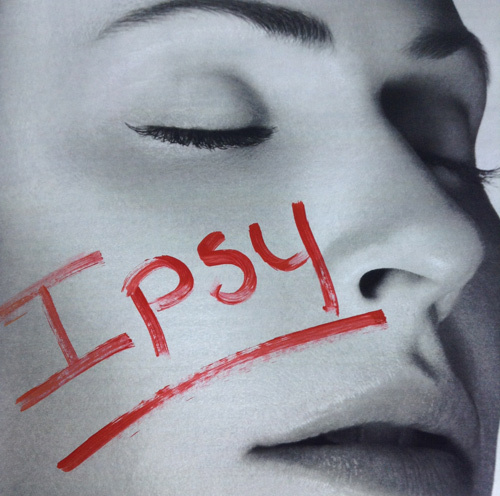 I think ipsy sells or gives them to their real customers : the companies who are paying for this product placement. ( I’ve come to the conclusion these beauty box vendors must be getting money in addition to products from the companies they represent because I think the price we pay really only covers shipping and handling. ) So the only way we’re not going to get blush is if EVERYBODY stood up and said “NO BLUSH”. Face Oil: The name on the package is misleading — it’s not scented. You should try it. I would keep it except it appears to leak. The fact they felt obliged to transport it in a little plastic bag makes me think this is a design issue. Creamy Lip Stain: Pfffttt. Pass. Color doesn’t suit me and I would just call this a lip gloss, not a stain. A not-so-shiny lip gloss. First Love Roll-on Perfume: You would hate this! LOL. Very floral, the wrong kind of floral IMO. Old lady-ish. NYX Eye Pencil in Silver Shimmer: I actually use silver eye pencils from time to time and I like NYX so this one worked out for me. I’m super relieved I didn’t get another volumizing spray. I have an eye curler already but I’m a-scared of it. So 1 out of 5. I guess I’d have to call this bag a bust too. Yeah, that blush is broke! If you contant ipsycare, they’ll send you a new product for free. If you want it haha. I’ve always assumed that ipsy has some sort of deal worked out with brands, such that money changes hands in some direction to let certain brands put an item in every bag, or a larger number of bags. Birchbox and Beauty Army let subscribers choose at least one of the samples they’ll get each month. That seems like such a great idea. At least one product will be something you’ve decided you like! I’ll give the face oil a try. Maybe. If it’s lucky!